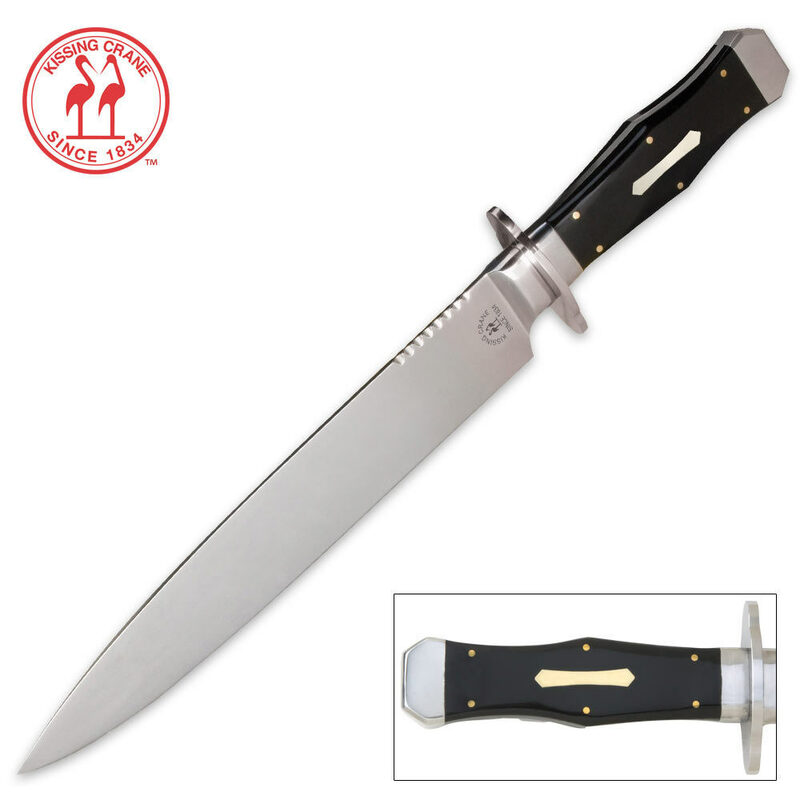 Kissing Crane Black Bowie Knife | BUDK.com - Knives & Swords At The Lowest Prices! More than 175 years since the conception of Kissing Crane's traditional folding pocket knives, there's finally a bowie. This American Classic Bowie offers the same legendary quality and style Kissing Crane is so well known for, now in a bowie. Very pleased with this knife. I'll probably never use it for anything as it looks so great I don't want to mark it in any way. This is the best product I have bought from KENNESAW. In fact I have been pleased with all my purchases. I have one recommendation I would like considered. It is usually a guessing game as to whether a knife purchased will be sharpened or require some expert care. It would be great if all the products were coded to indicate if they were shipped in a sharpened state. Just a thought. Also, I really am grateful as to how fast you fill the orders. I always receive my purchase in less than 5 days. That is super. I bought this to use as a hog hunting knife. It's construction and finish are above expectations for an intended working knife. Have not yet gotten to try it out on wild hogs, so real world feedback will com in the future. I originally wasn't expecting much with this knife, but I love traditional bowies so I purchased it in the BOGO deal. I received two of them and tested one and it is truly a workman's knife! It is sharp and slices with ease! It is even a decent chopper. It was not in perfect condition but it is certainly a great knife. You might have issues with the finish (which I just repolished myself) and the blade may not be perfectly straight but despite these minor issues the knife is amazing! Beautiful knife, however the one I received had a curve in the very tip of the blade and a nick in the handle. Absolutely poor attention to product condition.